India's largest consumer e-commerce firm Flipkart Online Services Pvt Ltd is shutting down Flyte MP3 Store, its online digital music store. Those who want to purchase music from the store (before it shuts down), must do so by June 17 this year. Post that date, the company will refund the remaining balance (if any) to one's Flyte wallet. Also, all the MP3 files that one has purchased from Flyte on or before June 17, will be available for download till August 18. But after that, buyers won't be able to download those afresh. As of now, Flyte offers up to five downloads post the purchase of a song, which can be stored in one's online library. Note that Flipkart's digital store also has a separate section for e-books, but that is not part of the planned shutdown of Flyte. "We set up Flyte MP3 a year back in what was an extremely nascent industry. The aim was to bring legal digital content to consumers in India. In a short span of time, we built a massive digital music catalogue at very affordable prices, along with a loyal base of nearly one lakh customers. However, we have realised that the music downloads business in India will not reach scale unless several problem areas such as music piracy and easy micro-payments, etc., are solved in great depth," said Mekin Maheshwari, head of digital media and payments at Flipkart. "It makes sense to take a step back from Flyte MP3 at present and revisit the digital music market opportunity at a later stage," he added. The company first launched the Flyte store in February last year (one of the first e-commerce companies to do so) and at that time, it claimed to be India's largest legal online music store with over a million tracks from 150,000 albums, available across 55 languages and 700 genres and sub-genres. It later launched apps for the same for the iOS, Android and Windows platforms and expanded the catalogue to over 5 million tracks. According to Maheshwari, users will be able to use the apps for listening to already downloaded music post Aug 18 (no new purchases or downloads will be allowed), but the company won't be actively supporting the app. So basically, don't expect any bug fixes or updates. 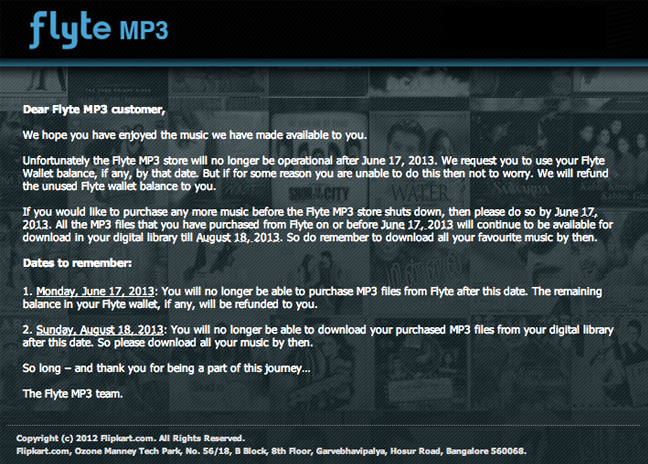 "Unfortunately, the Flyte MP3 Store will no longer be operational after June 17, 2013. We request you to use your Flyte Wallet balance, if any, by that date. But if for some reason, you are unable to do this, then not to worry. We will refund the unused Flyte wallet balance to you," reads a mailer sent by the company to its customers. As of January this year, Sameer Nigam, VP (Digital) at Flipkart.com, mentioned that the Flyte store had crossed 1.25 million music downloads and was closing in on the 1.5 million mark. This was in less than a year of operations. Flyte also competed with a bunch of legal digital music stores including Apple's iTunes and Hungama.com's own music store, which has the option of individual song download and subscription-based music pack purchase.